All transactions are safe and secure with a reliable history in online purchasing behind each of our associates. 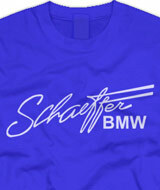 Buy the Schaeffer Used Cars t-shirt to own Eastbound and Down clothing and merchandise. In season one of Eastbound and Down, Kenny starts working as a spokesman for Ashley Schaeffer (Will Ferrell) of Schaeffer Used Car Sales. Schaeffer soon becomes Kenny's nemesis after some embarrassing tasks at a local meet and greet. Sport this Eastbound and Down Schaeffer t-shirt featuring the Schaeffer automotive logo that is visible throughout the episodes. In addition to the Schaeffer Used Cars tee above, browse the Eastbound and Down Clothing Gallery for more apparel like men's and women's clothes, kids shirts or hoodies.